I was pretty surprised to come across Beyond Magnetic on my local record store shelves. I thought this was supposed to be an exclusively digital release, but apparently, the fans demand was so strong that the band eventually decided to release the “physical” EP version. These B-sides from the Death Magnetic sessions were originally a gift the band had made to its fanclub members. Then the songs were released on Itunes, and the feedback was extremely positive, so what the hell, why not put out a low-price CD? Great idea & an excellent way to move on after the DISASTEROUS LULU. And that also explains the very minimalistic packaging: very simple cover, no booklet, just a cool picture on the back of the CD. At first, I was disappointed, but I have to admit it makes sense. These are only B-sides, and obviously the band just wanted to make them available for old farts like myself that absolutely WANT the physical CD. No need for a fancy packaging, bonus songs and useless linear notes. Simple cover, cheap price and most importantly: 4 very good songs; no more, no less, I kind of like that idea. There are 2 ways to “analyze” that EP. The first one is pretty simple: these songs are really cool, I personally LOVE “Just a Bullet Away”, with it’s awesome riff and very cool/typical melodic break in the middle. Your second option is to try and understand WHY these songs weren’t on the final Death Magnetic tracklist; especially that as said, they are pretty good. If you listen carefully, you can clearly tell that these songs are more “rock” oriented than Death Magnetic; that had a clear METAL orientation. I mean listen to the “Hell And Back” riff; it sounds like it escaped from the Load/Reload sessions! 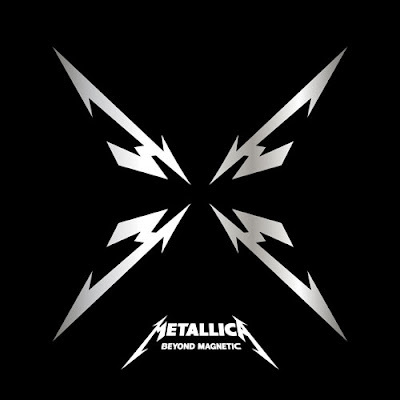 If you dig a little further, these songs actually sound like the perfect transition between St Anger and Death Magnetic! Maybe St Anger wasn’t just a horrible accident after all…(OK, most of you Metal fans want to hang me now). And that’s why I’m glad Metallica did release that EP because I personally love it when they inject that groove and rock vibe into their music. I’m actually a fan of many Load/Reload songs and I enjoy a lot of the St Anger Riffs (I did say RIFFS, not songs J). Another funny “coincidence”: the band’s black & white picture on the back of the CD: really looks like a picture from the Load/Reload period!